A couple of weeks had transpired since I reached the Panjshir Valley, got to know Saranwal Mahmoud Khan and Commander Sayed Najmuddin in Parion, then crossed into the north past Escarzar to be welcomed by Dr. Hussein. 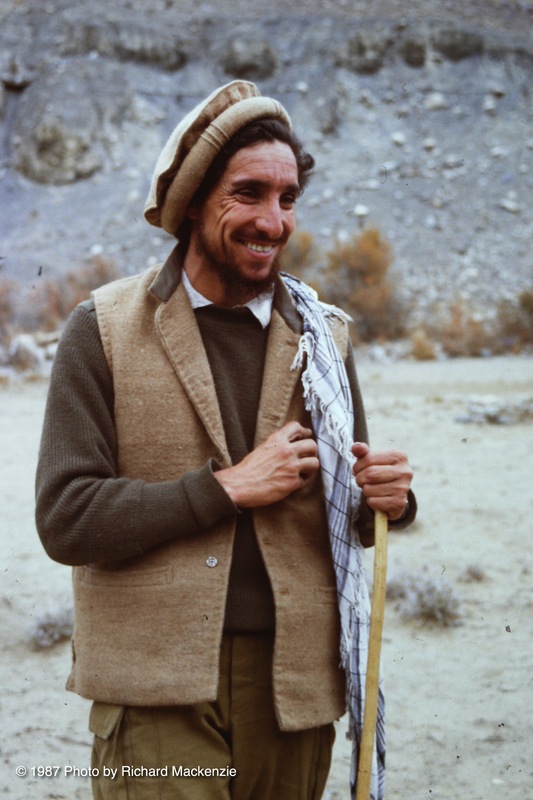 And then I finally met Amir Sahib, “the Honored Leader,” Commander Ahmad Shah Massoud. 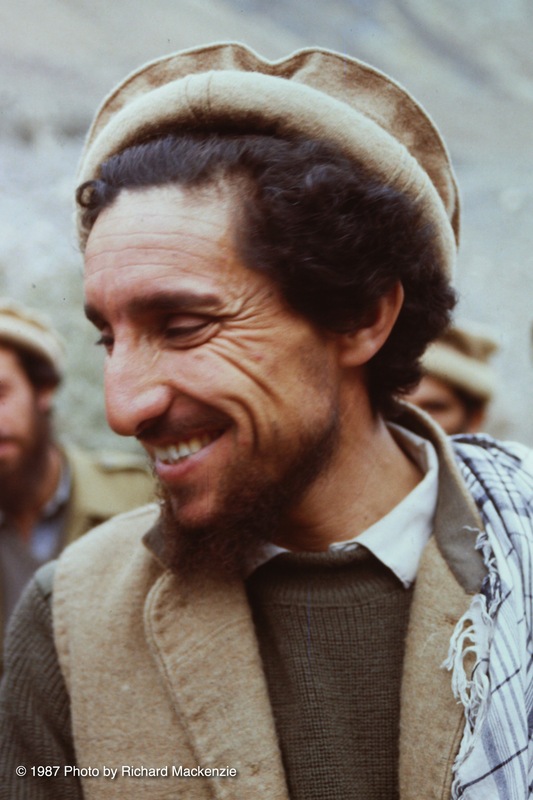 In my first interview with Massoud, he spoke at length about his life and his goals, his faith and the war that had already consumed so much of his life. He spoke of his own strengths and weaknesses — and the problems he encountered dealing with some of his so-called allies. His aide at the time, Dr. Abdullah, translated for us. It was a conversation I would never forget. 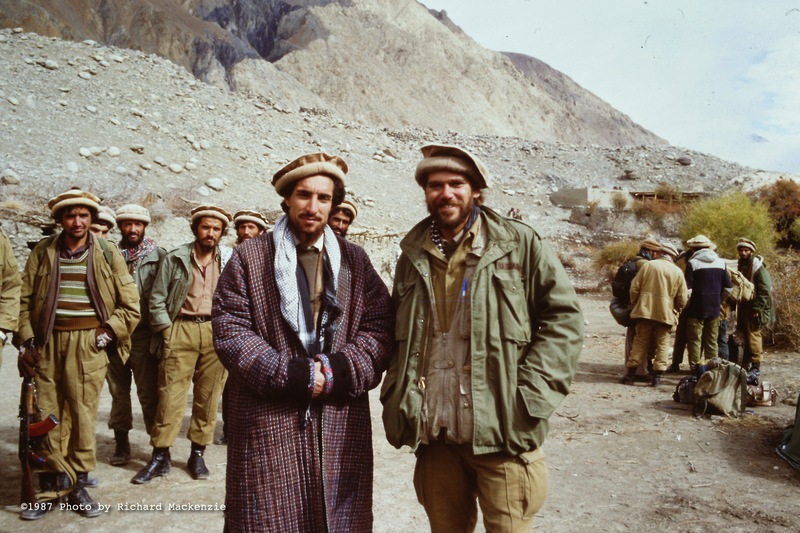 Richard Mackenzie, at right, with Ahmad Shah Massoud in 1987. Massoud: My father was a military officer and he served in different parts of Afghanistan. Therefore, wherever his duty was, the family was with him. When I was a child, my father served in Nangahar, Mazar, Ghazni, Badakhshan, Herat, Kabul and other areas in Afghanistan. Of course, I travelled with him. To tell you what kind of people we were in contact with — there is no doubt that the government officials are in the middle class. So I can say that we were dealing with middle-class people. Mackenzie: What influence did your father have on you? Massoud: Because my father was a military officer he was dealing most of the time with military affairs. This had an impact on me and led to my interest with the military. Mackenzie: What types of friendships did you have as a child? Massoud: Of course when you are a child you have friends both at school and where you live. I remember that my friends and I, when we were playing, most of the time our games were half military games. Mackenzie: That leads to this other question. When did your interests develop in the military? I heard a story that during the Arab-Israeli war in 1967, you are remembered in the classroom showing your friends on a map, the military maneuvers and explaining why this one was good and this one was bad. Massoud: Yes, that is right. At school I was an average student, no not even average, I was lazy, lower than average. I was spending most of my time playing on the streets. This was going on until I was in grade 11. I started studying, taking my courses seriously when at grade 12 of high school. During grade 12 and the two years at University, I was very good in my studies. Mackenzie: In the early years, what games did you play on the streets? 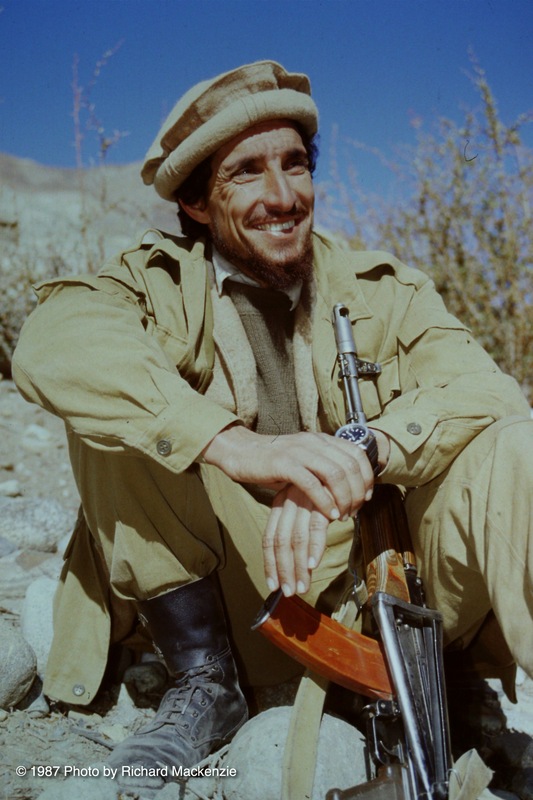 Massoud: There were many groups of street boys, like right now that there are groups of military… fighters; and we played military games, “stand straight, move, freeze…”Our house was near the mountain. We had a base in the mountain. So after fighting in different streets we would return to our base. Mackenzie: You are not married? Massoud: At the moment, no. I am so busy that I don’t even think about it. Mackenzie: I’m interested — if you can talk for a minute — why do you think discipline and education are so important for your soldiers? Massoud: This is very important for us. Along with discipline and education, we require our mujahideen to exercise their minds. This is what makes our mujahideen different from others. Mackenzie: Where did you get this idea? Massoud: I think it originates from my childhood and goes up to adulthood — to the period I started my struggle. It’s a need. Mackenzie: As a child was your family strict Muslim? Mackenzie: What is your idea of God? How do you see God? Is there a good God, a loving God? Yet so many people die in war. Massoud: God is one, he is the creator. He has created the whole world. And he is the main and most significant source of law on earth, because he has sent us the Quran to be the guide for human beings. God knows everything; God sees everything. Mackenzie: Why turn to the young intellectuals rather than the Mullahs? Massoud: I explained our duties, activities and operation earlier. For simple implementation and carrying-on of these duties, we need educated and literate people. We cannot progress with uneducated people. Mackenzie: You had a temporary truce with the Russians. I understand you have had a chance to make a long-term deal with them? Other mujahideen commanders have done this, why have you not? Massoud: Russians offered negotiations many times, but we did not accept. Because we believe that so far we have not been able to put significant military pressure on them. A pressure that would force the Russians to sit behind a table, accept us as a force, and truly negotiate. Mackenzie: At one point you evacuated the Panjshir Valley. This was very brave, was it difficult to do? Massoud: After the truce, I got valid information from the Russians themselves about their plan for an offensive operation. We realized that, if the people stayed in the region, they would suffer heavy casualties. Therefore, after consultations with the people’s religious leaders and commander’s councils we made a joint decision to evacuate the people. Because this was a joint decision, we had no problem in carrying it out. Mackenzie: The supply line from Pakistan to Afghanistan is very impressive, but you do not get Stingers, or do you? This is what I am told, if this is true, why not? 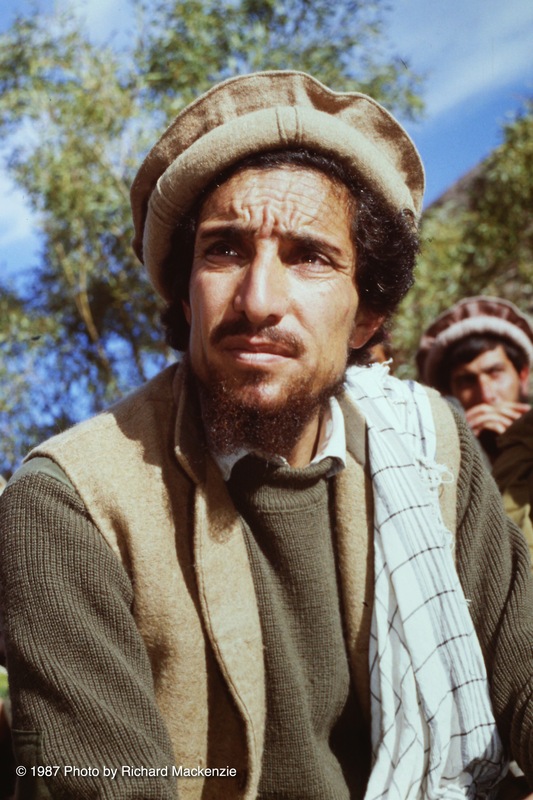 Massoud: There are disputes and problems between the Supervisory Council and these Pakistani authorities, the military officers who are in charge of arms distribution. It’s because the Pakistanis want everything to be under their observation and control. And this is what we dislike, we don’t want this. We support contact and having relations with them but never want to be tied to them and dependent on them. You know if a resistance movement depends on someone else or some other country, even if that country is an Islamic one, this causes the destruction of the resistance. And we have seen the consequences of such dependencies in history. For example, the dependency of Palestinians on Syria, the Kurdish movement’s dependency on Iran during the Shah’s Era; and more recently we see the Sri Lanka Tamils’ dependency on India. Therefore, we are never ready to accept such dependency, even if the cost is the termination of aid. And we have another reason, an internal one, about this matter too. First of all, the Pakistanis are not familiar with — they don’t know the situations, locations, and conditions of our territories. They are not familiar with our people, they are not directly involved in the war to be able to understand the situation thoroughly, and to decide what should be done. So, for these reasons, they cannot ever direct the Afghan war from inside Pakistan. This is the war of a people against the government. The Pakistani generals cannot understand the depth of this war. You know what the extent of the knowledge of the Pakistani generals is: you Americans get photographs of the area by your satellites and give it to them. And they think that they know everything. They gather some right or wrong information and think that’s it. It is not possible to understand and get a clear idea of the situation by a few pictures or photographs. So, the war is the confrontation between Communism and Islam. It’s a war of an organized aggressive force against a nation. Now, what should this nation do to fight the aggressor? The answer is not just money and weapons. There are tons and tons of other issues which should be considered — ideas, organizations, conditions and circumstances of the area, et cetera. So, in such matters it is not possible that Pakistanis could guide or direct the war from there. But that is what the Pakistanis are doing, directly inside Afghanistan. For example, they are directly involved in Paktia Region. What is the result? There is one garrison there, the Jari garrison, and it hasn’t been captured in all these years. What was the consequence of such actions in Zhawar, and anywhere else? The consequence is always negative. Mackenzie: Some of your people speak of you in awe, like you are almost a holy man, are you afraid of this, do you worry about this personality cult? Massoud: People think very highly of us, more than what we really are. Mackenzie: Wouldn’t you be a good leader for Afghanistan? Massoud: I think of myself as very small. There are many shortcomings that I know I do have. I do know that I am not qualified for that position. Mackenzie: What are your strengths? Massoud: I don’t see many strengths. But I do see lots of weaknesses in myself. Massoud: Laziness, idleness. I don’t think I am very active. Mackenzie: You should do more? Massoud: Yes, I should do more. Mackenzie: What are the prospects for the future: the length of the war and the peace talks? Massoud: I can’t tell you, no one can predict precisely how long the war will go on. I can say though that this war is, God willing, continuous. We are not optimistic about the peace negotiations, not at all. Mackenzie: Why do you think the war will continue for years? Massoud: As I said a while ago, the necessary military pressure is not there yet. Therefore, the Russians are not ready yet to give up their interests in Afghanistan. Mackenzie: Getting away from the serious questions, what makes you laugh, what makes you happy? Massoud: I am never unhappy in my life. Mackenzie: It is a special personality that allows you to be happy and in a good mood in the middle of all of this. Is there any question that I have not asked, that you think is important, that I should have asked? Massoud: You came a long way and had to wait so long. We apologize for not being able to provide you with better food and lodging, this is a mountainous area. Any difficulty I had faced was inconsequential compared to the challenges endured by this man. He had been both kind and generous with the time he had given me — especially as he was preparing for what could be the biggest and most important offensive of his war so far. The next day, he would spell out the strategy and tactics of that battle to the men who would put their lives on the line under his leadership. As I left him after this interview, I didn’t realize it would be the first of so many. I would talk with Massoud and get to know him as I returned repeatedly to Afghanistan numerous times over the next decade. Listening to tapes of those interviews now, it is so hard to believe he is gone. But, thankfully, we can still hear what he had to say — and learn from it. The war is a confrontation between Communism and Islam. This entry was posted in Ahmad Shah Massoud, Dr. Abdullah, Panjshir River, Panjshir Valley, Saranwal Mahmoud Khan. Bookmark the permalink. Massoud! Please come back and sort the current mess out, we people never speak very high of you, your the highest person but it’s your modesty that always mixed with your charming ethics. Good job, thank you sir very much for what you have doing for us. 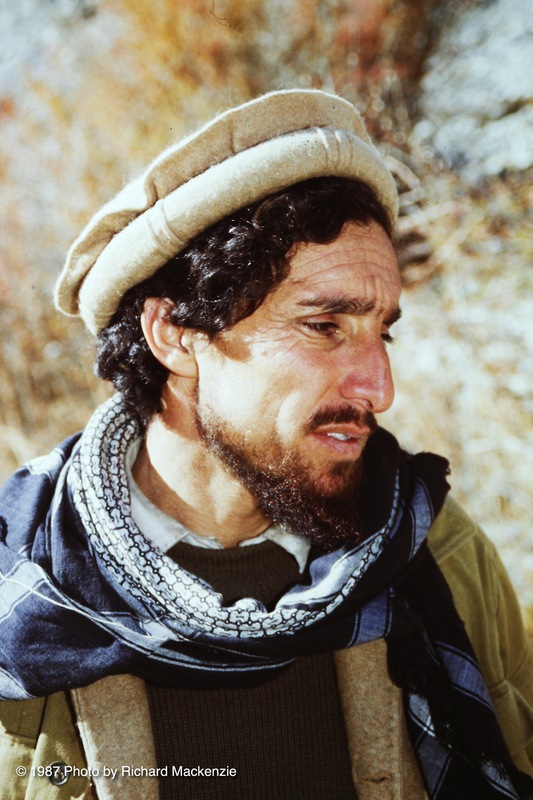 Martyr Ahmad Shah Massoud the National Hero of Afghanistan. he would have been a great president for Afghanistan,., that is the saddest part,.. that He was taken way too early,.. he would have been a great president,.. And I believe world history would have been much better because of him,.. Your truly writing greatly impressed me and made me cry. May great god bless Amir Sahib and all Mujahideens. We are very hopefully looking forward to seeing your next story. Massoud the Great rest in peace. Thank you Mackenzie for your efforts.